Unfortunately, due to sales rights restrictions, we cannot offer Pride and Persecution for sale in your country. will be joined by a number of other paintings by Steen from private and public collections across the world. Three essays will examine the core themes of the show - the role of Jewish history in Steen's Old Testament scenes; the infl uence of Dutch theatre on his work; and the critical response to his Old Testament paintings from the 17th century to date. Robert Wenley (Barber Institute of Fine Arts) will look at how the Dutch nation established its identity in part by associating its people with the Biblical Israelites, seeing themselves as persecuted by the Spanish for their faith. 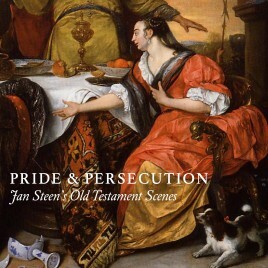 He will explore the popularity of the story of Esther and other Old Testament subjects in Dutch culture - in plays as well as paintings - and the possibility of Jewish patrons for Steen's Old Testament paintings. Nina Cahill (University of Kassel) will put forward new research about how Steen adopted the gestural language of contemporary Dutch theatre, amateur and professional, in order to represent the key fi gures in these scenes and to convey the pivotal dramatic moments. In some instances, Steen may have been quoting from an actual production of a play based on the Biblical story. Rosalie van Gulick (Utrecht University) will consider how Steen's Old Testament scenes have been received and understood over the years. She will investigate how the apparent farcical character of these scenes has been understood over the centuries and why they have prompted adversely critical responses from some modern art historians.